For those who live in Downtown Los Angeles Bunker Hill and Grand Ave should be a point of pride in the community. Home to the Frank Gehry-designed Walt Disney Concert Hall, The Museum of Contemporary art, and now The Broad Museum designed by Diller Scofidio + Renfro on Grand Avenue is set to be an international, cultural hotspot. The Grand Ave. project and development has been overseen by The Grand Avenue Committee for many years. In 1996 Eli Broad was instrumental in securing the $50 Million deposit for Grand Park and Grand Ave. projects and thanks to the hard work and philanthropy of Eli and Edythe Broad the Broad Museum will open September 20th. Ranked by Forbes magazine as the 185th richest man alive Eli Broad has become one of the foremost protecters, owners, and lenders of art in the world. Founded in 1984, in the first two decades of formation, the Broad Art Foundation lent 8,000 pieces to 500 institutions world wide, reaching over 100 million viewers annually. The collection is known as one of the most expansive and top ranked in the world. The Broads have a strong will to help make Los Angeles a cultural center of the world for the arts and with their undying generosity they are doing just that. The generosity the Broads have shown towards the arts and education is a rare find nowadays in the world of high prices art auctions growing every time a billionaire tiers of a piece of art hanging in their bathroom. 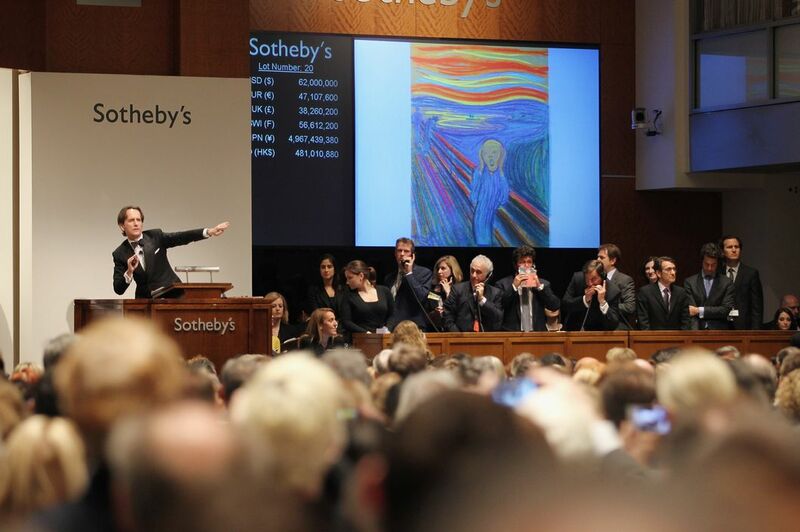 New York Times Art Critic Jerry Saltz has written several pieces recently about the state of big-money art auctions and how they are detrimental to art history and appreciation. Recently in a piece about the sale of The Scream by Expressionist painter Edvard Munch Saltz writes, “I hate art auctions. Not just because they’re freak-show legal casinos, spectacles where the Über-ultrarich can act out as profligately in public as possible, trying to buy immortality, become a part of art history, make headlines, and create profit. I don’t only hate them because they may be the whitest sector in the entire world. I hate them for what they do to art, for the bad magic of making mysterious powerful things turn into numbers.” The work was sold for $119.5 Million to an unknown telephone bidder and will probably disappear from the public eye for another century. It’s the “Über-ultrarich” Saltz sees as the problem stating, “The Scream is a part of art history and should hang in a public collection, probably in Norway, and not just decorate a California den or a dacha in the Ukraine.” Fortunately for those of us that can’t afford to drop over $100 Million on a piece of den decoration there are people like the Broads who see the magic and not just the numbers.